I figured I'd consolidate some of the recipes I'm using this Christmas into one post, so I'd have them for future reference. CINNAMON ROLLS 101- these seriously sound like they will cause all who consume them to instantly commence with the "Mmmmm"s. I can't wait to try them. (And for some other morning, because they look so amazingly delicious: ) Cinnamon Sugar French Breakfast Puffs- Buttery, sugary, cinnamony moist breakfast muffins. They look positively sinful. Molly's Refried Beans - These require bacon, which we can't get here. So I might need to get a fatty piece of turkey or something to make them. Refried Beans with all the facts- This site gives GREAT information about when and why to make beans from scratch, and her recipe sounds great too. Well, the sweets came out great! 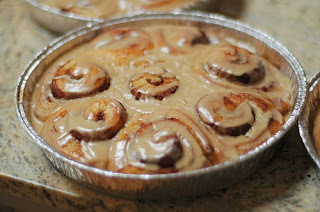 :) Those cinnamon rolls AND those muffins are completely to die for. Every single bite of both was absolutely scrumptious. As for the beans, well, I'm sure they would have been good if I lived in a place where, say, pinto beans were available... and where I could get some bacon to flavor the beans. Hi, I found your blog while searching for chicken recipes, I think it's great! !